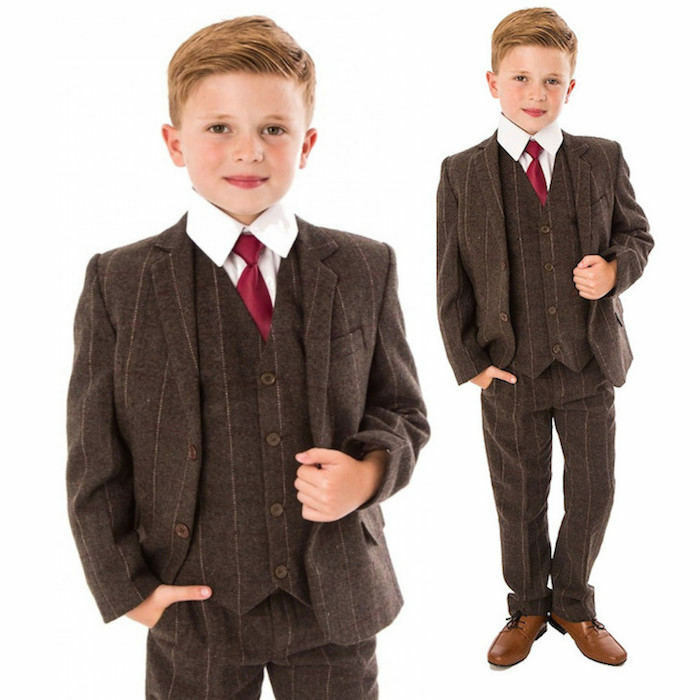 Brown tweed herringbone 5 piece jacket suit for baby boys, toddler or older boy, perfect for a pageboy, guest at a wedding or other special occasions. Jacket: Brown tweed fabric jacket, woven with a herringbone pattern and overlaid with a check design, double pockets on front, buttons to the centre and cuffs. Waistcoat: Brown tweed waistcoat, fully lined, pocket with a contrasting mock handkerchief, 3 brown centre buttons, plain dark brown back, adjustable strap/buckle on back for perfect fit. Trousers: Matching brown tweed trousers, button fly, double pockets, belt hoops, elasticated on rear. Tie: Satin effect burgundy tie, elasticated neckband, complimenting the suit perfectly. For a luxury coloured satin tie to follow your theme, select from an array of over 20 colours (tie on elastic for 0-4 years, 45" tie for 5-14 years). This luxury 5 piece brown tweed check outfit will make him look like the perfect handsome gentleman at any occasion. Made with 100% polyester and has a superior quality, comfortable soft feel. Cut to precision and stitched to a high standard with great attention to detail. Complete with tags, hanger and a protective clear suit bag. 0-3 Months 23cm / 9" 35.5cm / 14" 40cm - 46cm / 16" - 18" 46cm / 18" 51cm / 20" 16.5cm / 6½" 20½cm / 8" 24cm / 9½" 53.5cm / 21" 11.5cm / 4½" 25.5cm / 10" 34cm / 13½"
3-6 Months 24cm / 9½" 38cm / 15" 43cm - 48cm / 17" - 19" 50cm / 20" 57cm / 22½" 18.5cm / 7¼" 23cm / 9" 26.5cm / 10½" 56cm / 22" 11.5cm / 4½" 24cm / 9½" 34cm / 13½"
6-9 Months 25cm / 10" 40cm / 16" 43cm - 48cm / 17" - 19" 52cm / 20½" 58cm / 23" 20.5cm / 8" 24cm / 9½" 28cm / 11" 56cm / 22" 13cm / 5" 26.5cm / 10½" 35.5cm / 14"
9-12 Months 25cm / 10" 40cm / 16" 44.5cm - 49.5cm / 17½" - 19½" 56cm / 22" 61cm / 24" 20.5cm / 8" 27cm / 10½" 29cm / 11½" 61cm / 24" 14cm / 5½" 26.5cm / 10½" 36.5cm / 14½"
12-18 Months 26.5cm / 10½" 43cm / 17" 44.5cm - 49.5cm / 17½" - 19½" 58.5cm / 23" 64cm / 25" 23cm / 9" 28cm / 11" 30.5cm / 12" 61cm / 24" 15.5cm / 6" 28cm / 11" 36.5cm / 14½"
18-24 Months 30.5cm / 12" 47cm / 18½" 46cm - 50cm / 18" - 20" 61cm / 24" 66cm / 26" 25.5cm / 10" 30.5cm / 12" 30.5cm / 12" 66cm / 26" 15.5cm / 6" 28cm / 11" 39.5cm / 15½"
2 Years 33cm / 13" 50cm / 20" 49cm - 53.5cm / 19" - 21" 61cm / 24" 67cm / 26½" 27cm / 10½" 34cm / 13½" 32cm / 12½" 68cm / 27" 18cm / 7" 30.5cm / 12" 43cm / 17"
3 Years 39cm / 15½" 56cm / 22" 49cm - 53.5cm / 19" - 21" 63.5cm / 25" 68.5cm / 27" 31cm / 12" 37cm / 14½" 32cm / 12½" 68cm / 27" 21.5cm / 8½" 35.5cm / 14" 44.5cm / 17½"
4 Years 46cm / 18" 64cm / 25" 51cm - 56cm / 20" - 22" 63.5cm / 25" 73.5cm / 29" 32cm / 12½" 39cm / 15½" 32cm / 12½" 70cm / 27½" 24cm / 9½" 38cm / 15" 46cm / 18"
5 Years 48cm / 19" 71cm / 28" 51cm - 56cm / 20" - 22" 66cm / 26" 76cm / 30" 33cm / 13" 41cm / 16" 33cm / 13" 74cm / 29" 28cm / 11" 43cm / 17" 50cm / 20"
6 Years 56cm / 22" 79cm / 31" 53.5cm - 58.5cm / 21" - 23" 66cm / 26" 76cm / 30" 34cm / 13½" 42cm / 16½" 33cm / 13" 76cm / 30" 29cm / 11½" 43cm / 17" 53.5cm / 21"
7 Years 57cm / 22½" 80cm / 31½" 53.5cm - 58.5cm / 21" - 23" 68cm / 27" 77.5cm / 30½" 38cm / 15" 45.5cm / 18" 35.5cm / 14" 76cm / 30" 30.5cm / 12" 46cm / 18" 53.5cm / 21"
8 Years 57cm / 22½" 81cm / 32" 56cm - 62cm / 22" - 24" 68cm / 27" 84cm / 33" 39.5cm / 15½" 49cm / 19" 35.5cm / 14" 81.5cm / 32" 32cm / 12½" 49cm / 19" 56cm / 22"
9 Years 60cm / 23½" 82.5cm / 32½" 61cm - 66cm / 24" - 26" 71cm / 28" 86cm / 34" 42cm / 16½" 49.5cm / 19½" 38cm / 15" 84cm / 33" 34cm / 13½" 49.5cm / 19½" 61cm / 24"
10 Years 65cm / 25½" 88cm / 34½" 63.5cm - 68.5cm / 25" - 27" 76cm / 30" 86cm / 34" 42cm / 16½" 51cm / 20" 38cm / 15" 86.5cm / 34" 35.5cm / 14" 50cm / 20" 61cm / 24"
11 Years 68.5cm / 27" 93cm / 36½" 63.5cm - 73.5cm / 25" - 29" 81cm / 32" 89cm / 35" 44cm / 17½" 53.5cm / 21" 38cm / 15" 86.5cm / 34" 37cm / 14½" 54.5cm / 21½" 62cm / 24½"
12 Years 73.5cm / 29" 95.5cm / 37½" 63.5cm - 73.5cm / 25" - 29" 81cm / 32" 89cm / 35" 44cm / 17½" 53.5cm / 21" 38cm / 15" 91.5cm / 36" 37cm / 14½" 54.5cm / 21½" 65cm / 25½"
13 Years 77cm / 30½" 99cm / 39" 68.5cm - 76cm / 27" - 30" 86cm / 34" 91.5cm / 36" 52cm / 20½" 62cm / 24½" 38cm / 15" 96.5cm / 38" 40cm / 16" 58cm / 23" 67.5cm / 26½"
14 Years 80cm / 31½" 104cm / 41" 71cm - 79cm / 28" - 31" 88cm / 34½" 91.5cm / 36" 53.5cm / 21" 64cm / 25" 40cm / 16" 101.5cm / 40" 42cm / 16½" 61cm / 24" 71cm / 28"
Lovely suit. True to size for my tall 10 year old. Fits him well as I double checked the measurements before ordering. Good quality and arrived quickly. This little suit is excellent value for money and looked very smart paired with brogues for a wedding. Communications with the seller was excellent.